Whether it is the push to increase education spending at the state level or the plan to raise property taxes to fund more buildings and other capital outlay projects, the push for more spending is based on the misguided belief that the schools simply don’t have enough money. 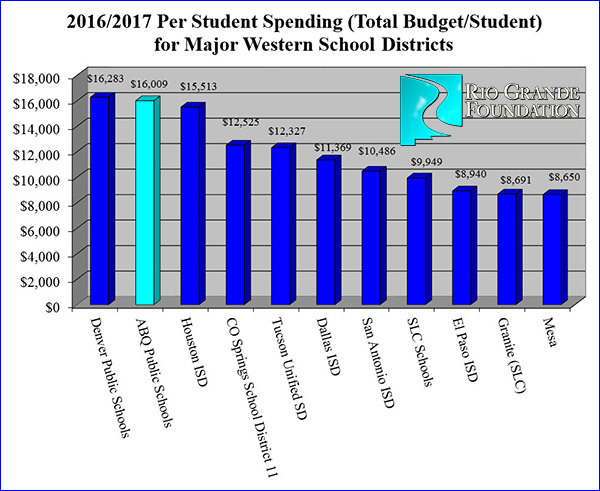 As the Rio Grande Foundation found when we looked at overall budgets for the largest school districts in the region, the idea that New Mexico’s largest school district is starved for resources relative to higher-performing districts throughout the region is simply false. Notably, since this data was compiled APS has seen its student population continue to decline and funding has crept higher. Based on the 2018-2019 budget which states the district’s student population is down to 81,755 and total spending is up to $1,350,000,000, per-pupil spending at APS is now $16,513 annually.